With an amusing tagline ("Only a ball should bounce"), one might hope for something a little playful and less dismally ugly. One might hope, but one would be disappointed. Bitter experience has taught us that D-cup-wearers can't be choosers. On the other hand, one is greatly amused in speculating precisely what "high impact activities such as... police officer" could be. Oh, yes. 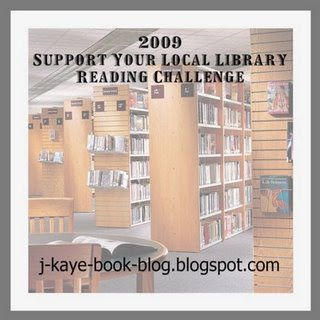 That Reading Challenge. I absolutely intended to post about my January books in January. I should be having a toasty February here in frosty* Ottawa, what with all those good intentions I make then completely forget. Missed intentions notwithstanding, I have been reading! I have been visiting the library! I just haven't been writing about it. Because I'm disorganized that way. The Omnivore's Dilemma -- Terrific book. It will make you reconsider how you perceive your food, and may even change what/how you eat. The first two sections are by far the more engrossing/compelling. I understand why the third section was necessary, but it dragged. Apart from the discussion of meat-eating, which was interesting, I could easily have skipped the entire thing. (In this section I primarily learned that Michael Pollan sure does like himself...) This does not detract from the value of the book, which I liked so well that I went out and bought my own copy. But it started as a library book, so that counts. The Uncommon Reader -- The unexpected fallout of royal bookworm-ery. Funny and clever -- and short! The Aging Brain -- Interesting subject matter, unremittingly boring book. Badly in need of a stern and unyielding editor. The man has no idea how to streamline his ideas, clearly believing that the more technical terms one crams into every paragraph, the more erudite one appears. My brain aged a solid decade just getting through the first two pretentious chapters. Garden Spells -- Quirky and entertaining light read. The Russian Album -- My Canadiana quota. There were more, but I've forgotten. Oh, the shame. Still, five for the month puts me well on track toward my goal of fifty for the year. Family myths. We all have them. You know, "Oh, sis is so [insert trait here]", "Brother is the [trait] one." For years my mother -- my entire family -- always passed the gravy boat by me, based on my preschool loathing of the stuff, despite the fact that at every holiday gathering in my adult life I'd been grabbing the damned thing back and liberally dousing my mashed potatoes with its delectability. We have myths in our family. I'm sure there are some I buy into without even realizing it's a myth, but there are others I watch with some bemusement. I don't necessarily say anything; many myths serve a useful and empowering purpose... but myths they remain. I've even used myths. Shortly after she'd learned to read, my middle step-daughter was finding this whole 'literacy' schtick hard-going. Reading was difficult for her, and, being the contrary little cuss she was at that age, she was resisting mightily. Add to that a mother who sees time spent 'with your nose in a book' as time wasted, and the girl was well on her way to being functionally illiterate. Enter devious me, weilding the parental tool of the Family Myth. Every time we saw her even glance at a book, Matthew and I would start perpetrating the myth: "There she is, reading again! That girl always has her nose in a book!" (Only in our family, that was a good thing.) "Lizzie's such a reader, just like her dad!" "It sure is nice to have such a book-loving family!" And it worked. In very short order (two months? ), Lizzie (and all of her siblings) bought into the myth. Lizzie was A Reader. And, perceiving herself to be a reader, so she became one, and the myth became a reality. She is still the child most likely to have a book on the go, the one most likely to bring a book in her backpack against those empty moments. So. Let this stand as proof that I have nothing against the family myth, providing it's a positive thing. What bemuses me is how people buy into things that are patently false. It's very weird. We have a bunch right now, surrounding the dog. - She has a most particular fondness, a tremendous bond of adoration, for Matthew. It's odd, this family tendency to slice up and allocate the dog's affections. While the first one totally confounds me -- I have no idea where it came from, or on what it could possibly be based -- the other two have some basis in reality. She pays more attention to my youngest step-son because he pays more attention to her. However, she pays him no more unsolicited attention than she does anyone else. Well, she greets Matthew like a crazy thing when he walks through the door: leaping up, licking his face, yodelling. She does not do that to me. She does not do that to the children. This much is true. She does not do that to the rest of us because we don't let her. I trained her within the first month that she was not to jump up on me, and so, when I come through the door, she does not jump up on me. The children did the same. Matthew, however, loves the jumping, and so permits (even encourages) it. And now the fact that she goes banzai when he walks through the door (and a more muted form of banzai when the rest of us do) is read as the dog loving him more intensely. Am I annoyed by this? No. Nor will I ever, ever do anything to dispell the myth. Indeed, I encourage it. He often travels for work. When he is gone, she'll walk up to his side of the bed, put her chin on it and sigh. She takes his slipper into her crate, and sleep with her nose in it. I make sure to tell him these things. I do not tell him what I know from the children: She does these things for me, too, on the far rarer occasions when I am away for a day or two. He considered a few options -- join a book club, take a course, volunteer -- but what he decided in the end was to get a dog. A dog would get him out of the house, would give him casual social interactions with other dog-owners at the park, and would give him a source of affection and pleasure. The dog has done all that. Daily walks, chat with other dog-owners, and a living, loving creature to take pleasure in, something to bring a measure of joy to his (mildly) depressive soul. It brings me great satisfaction to see his genuine need met in such a simple, wholesome, loving way. If part of his joy is predicated on the myth that she loves him above all others?